Matt Smith, the Eleventh Doctor, looks gangly and intense in new set pics from today's Doctor Who filming. 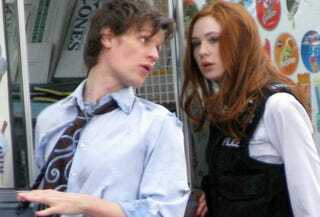 And then there's Karen Gillan's police, errr... uniform. Click through for gallery. Can people in the UK confirm that this is not how female police officers actually dress? Not that I'm opposed to fetishwear on Doctor Who — far from it. I'm just curious. And yes, you can glimpse Matt Smith wearing the ruined remains of David Tennant's costume in some of these photos, which come from the season opener. Apparently the new Doctor gets the post-regeneration munchies really bad, and runs to an ice cream truck. Or is there more to it than that?